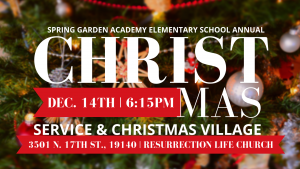 You are invited to the Spring Garden Academy Elementary School’s Annual Christmas Service! Join us Friday, December 14th at 6:15, at Resurrection Life Church for a night of singing, rejoicing, and holiday cheer at the annual Christmas Service! The service will be followed by our famous Christmas Village featuring local vendors.